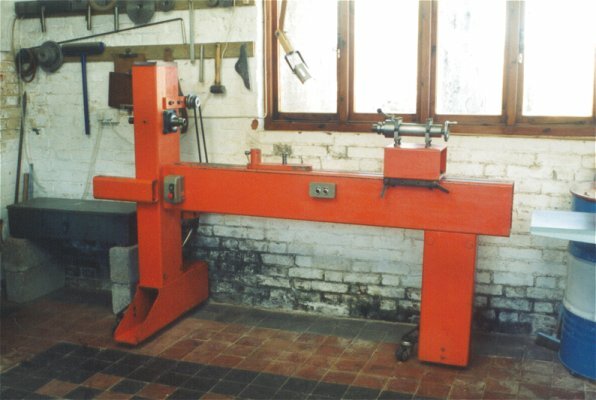 The lathe was designed, fitted and assembled by myself in 1979. The components were prepared by a local firm of engineers. The lathe accepts accessories made for the Harrison Union Graduate lathe and slightly exceeds the capacity of that machine. Workpieces may be up to 1905 mm (75in) long or 660mm (26in) diameter. The spindle centre height from the floor is 1210mm (47.6in). It has a 750 watt (approx 1HP) induction motor driving the spindle at approx 450, 800 or 1450 rpm via a quick-change pulley system.